Download Windows Media Player if you don’t already have it installed on your computer. Open it by clicking on the icon on your desktop or through Start – Programs – Windows Media Player. After it opens click on the Sync tab on the navigation bar. A panel will open on the right titled “Sync.” Connect your SanDisk Sansa Clip 1GB to your computer via the USB cable. Plug the larger end of the USB cable into your SanDisk Sansa Clip and the smaller end into a USB port on the front or back of your computer. When your computer detects the Sansa Clip, an AutoPlay screen will open. You can close this screen by clicking Close at the bottom of the screen. In Windows Media Player, a picture of your Sansa Clip should be on the left side of the screen. Find the MP3 files on your computer you want to transfer to your SanDisk Sansa Clip. Once you find the MP3 files, you need to transfer them to the Sync panel in Windows Media Player. To do this, highlight the MP3s you want to transfer and drag and drop them into the Sync panel. If you want to transfer more than one MP3 at a time hold down the Ctrl button as you click on the songs you want and it will highlight only those songs you click on then drag them to the Sync panel. When you have the MP3s in the Sync panel, click on Sync at the bottom right of the panel. The transfer will start and you will see the status in the bottom right corner. Let it finish transferring and finalizing the MP3s. Now that the MP3s are in Windows Media Player you can transfer them to your SanDisk Sansa Clip. With Windows Media Player open click the Rip tab twice then click Format MP3. Click the Rip tab again and choose the bitrate and any other options you want. The best bitrate to use should be 192 or 256. When it is finished ripping the MP3s click on Start and Computer and click on the folder where the MP3s are stored. Right click on the folder or individual songs and choose Copy. Next go to your Sansa Clip folder in Windows Explorer, right click on it and select Paste. Disconnect your Sansa Clip from your computer and make sure the MP3s transferred. Music in iTunes is in AAC, M4A, M4B and M4P format. The music on your SanDisk Sansa Clip is in MP3 format. To transfer music from iTunes to your Sansa Clip you have to convert the music to MP3 format. There are different ways to convert the music. You can do it manually through Windows or use an audio converter. In this article, we are going to use an audio converter called NoteBurner and you can download it here. After you have it installed open NoteBurner and click on Settings at the top. An Options dialog box will open. For Output Format change it to MPEG-1 Audio Layer 3 (MP3). Click on the MP3 tab and check the Enable ID3Tag V1 and Enable ID3 Tab V2 is checked. Click OK to save. Open iTunes. You can either use an existing playlist or create a new playlist. If you create a new playlist you need to add the songs you want to convert to it. To add a new playlist click on File then New Playlist and name the playlist. Click on Music under Library and select the songs for your playlist. When you select the songs right click and select Add to playlist and choose the playlist you just created. You can transfer one MP3 at a time, or hold down the Ctrl button on your keyboard while you click on each song you want to transfer then drag them over all at once. In iTunes you will be prompted to choose a CD burner. 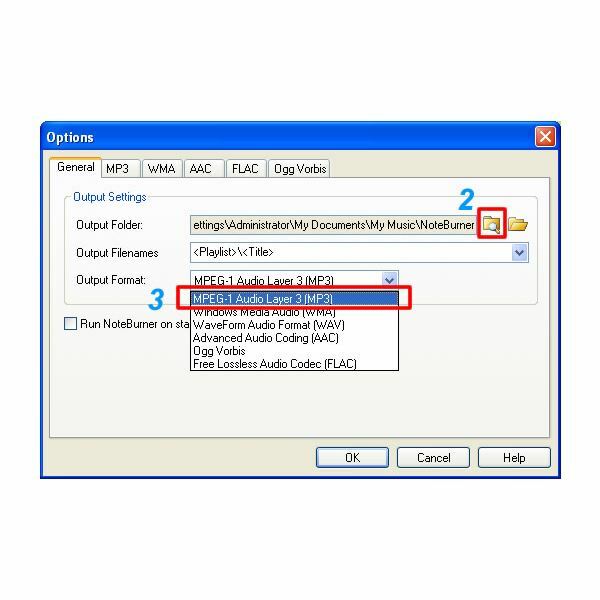 You need to choose NoteBurner Virtual CD/RW as the CD burner. Select Audio CD as the Disc Format and check Include CD Text. Click on the Burn Disc button in the bottom right hand corner of iTunes. The playlist will start burning. TIP: A 1GB SanDisk Sansa Clip MP3 player can hold approximately 300 songs, depending upon how long the songs are, etc.